Adventures in the Endless Pursuit of Entertainment: Betty Buckley: For the Love of Broadway! Betty Buckley: For the Love of Broadway! Last year, I had the opportunity to meet Michael Feinstein at a Blogger Meet/Greet for his upcoming show, All About Me. Besides being an extraordinary recording artist, performer and preservationist of the American Song Book, for the last ten years, he has been the proprieter of that great nightclub Feinstein's at the Regency. I didn't hesitate to demand of him, "When are you bringing Betty back?" He responded, "Next year, but she can't do any of her jazz. My patrons want her to do Broadway." I don't necessarily agree with that, and you know I told him so. For the record, I'll listen to her sing anything she wants to sing. So, now she's back at Feinstein's until February 27th and she's sticking to her contract: BROADWAY. But this time, instead of doing the songs she's known for from the nine Broadway shows she's been in, she's bringing a whole new set of show tunes that she hasn't performed before, in some cases out of the shower that is. She joined Twitter a few months ago and her tweets are as open and friendly as she is and of course, she holds nothing back. When preparing for this gig, she held a twitter contest amongst her followers to name this show. The winning title was "For The Love of Broadway!" It is indeed that. But don't expect Betty to completely stick with the book. Her band of twenty years, lead by the magical Kenny Werner and rounded out by Tony Marino on bass and Billy Drewes on Reeds and percussion, is there to help her jazz up the charts. There's a belted number or two, plus one tongue in cheek number that's written especially for this occasion, titled "When I Belt" by John McDaniel and Eric Kornfeld. 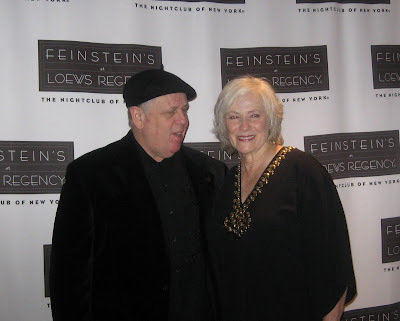 McDaniel, fresh off his two week stint of music directing Tyne Daly at Feinstein's, served as "musical consultant" for Betty. Some of the other Broadway tunes presented are well known standards, a few are more esoteric. Particularly beautiful were two medleys from classic shows, "We Kiss in the Shadow/I Have Dreamed" from The King and I, and "Come to Me, Bend to Me/This Nearly Was Mind" from Brigadoon and South Pacific. One of my favorite things about Betty's sets, whatever the genre, is her knack to partner songs that one usually wouldn't associate together. She weaves the lyrics into a tapestry of thoughtfulness, warmth and comfort. It's one of the main reasons that keeps me going back time and time again to see her perform, wherever the gig may be in New York, but especially at Feinstein's. Just blocks uptown from Feinstein's at the Regency, Elaine Stritch is celebrating her 85th birthday with a gig of her own at Cafe Carlyle. Betty had the opportunity to catch her show and called it an inspiration: "I hope I can still sing when I'm 85." She went on to say, "Stritch just appears out of nowhere [when I need her] - she's like my guardian angel. If I ever write my memoir, I think I'm going to call it 'Elaine Stritch is my Gaurdian Angel'." She took this opportunity to launch into "I Never Know When to say When", a song that just says it all, from the 1958 Goldilocks in which Elaine starred. Six years ago, Betty left New York to return to her native West Texas. Quoting Andy Warhol's "Success is a job in New York," she makes it a point to come back for gigs at least once or twice a year. If you've seen Betty as many times as I have, you know she's all about music, whether its jazz, standards, girl singers, songs from the 60s, international music, or especially Broadway tunes. She adds her own unique spin, sharing her point of view, and brings that steely, powerhouse voice to make even the most mundane an emotional ride. I'll be seeing Betty at least twice more this month, but I'm greedy in my desire for more of Betty's voice live. So when the folks at Feinstein's invited me to press night, I jumped at the chance, this time with Noah in tow. Feinstein's has fast become that place "where everybody knows my name" - I often run into friends there and even a neighbor is one of their excellent waiters. It's not exactly cheap, but it's definitely worth every penny and believe me, you get what you pay for from the talent to the atmosphere to the service. After the show, we joined most of the audience backstage for a champagne reception. When I told her who I was from Twitter, I was greeted with a cheer and a hug. What a thrill to talk to her in person (and for more than 140 characters)! By the way, we had a conversation about shoes and I have been assured that she'll be kicking it in a new pair of sparkley heels by Saturday night, when Kevin, Karigee and I are there to take in her late show.